Irish beef prices continue to rise, the latest Livestock and Meat Commission (LMC) figures show. The LMC figures show that, in recent weeks deadweight beef prices in Ireland have been improving steadily with an R3 heifer price of 419.8c/kg for the week ending February 15, 2015. This shows a 2.1c/kg increase from the previous week (ending February 8). 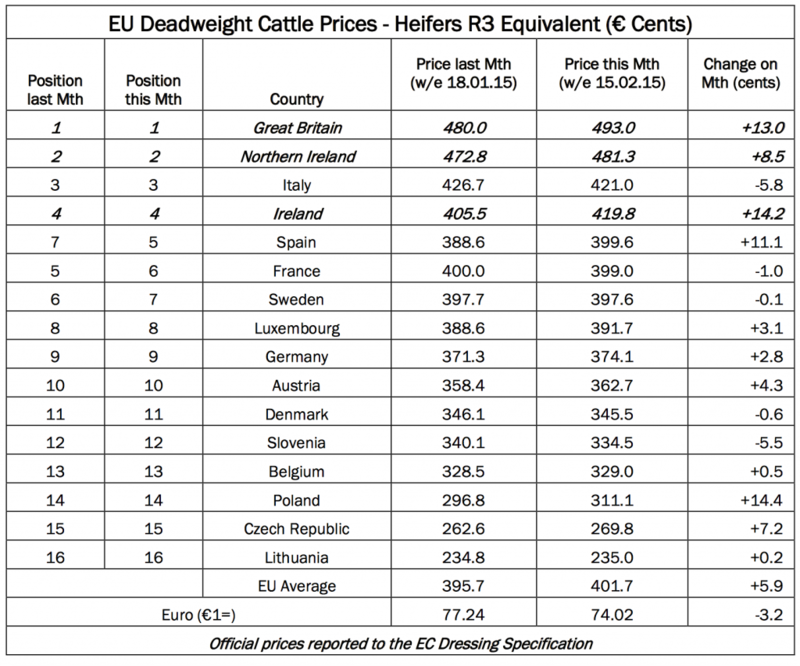 The LMC says that the average R3 heifer price in the EU was 401.7c/kg up 5.9c/kg from 395.7c/kg in the week ending January 18, 2015. The UK has retained its top spot in the EU league table of R3 heifer prices with an equivalent price of 493.0c/kg, the LMC says. LMC figures show that this is an increase of 13.0c/kg from the week ending January 18, 2015. In Northern Ireland, the R3 heifer price for the week ending February 15 was the equivalent of 481.3c/kg, up 8.5c/kg from 472.8c/kg in the week ending January 18. LMC figures show that the Republic’s R3 heifer price has increased to 18.1c/kg (up from 17.6c/kg from the previous week) above the EU average price. The Republic’s prices are 61.5c/kg lower than the equivalent price in Northern Ireland, the LMC says. The LMC’s latest figures show that while Ireland’s heifer price increased on the previous week, Italy have overtaken Ireland on the EU league table.